Composting is nature’s way of recycling organic matter. It is a process whereby; biodegradable organic matter is broken down by microorganisms in the presence of oxygen. The product of this process is compost, which benefits the environment as a natural fertilizer for gardening and farming. By recycling the organic material, valuable nutrients and organic matter are recycled, hence, alleviating the solid waste problem. 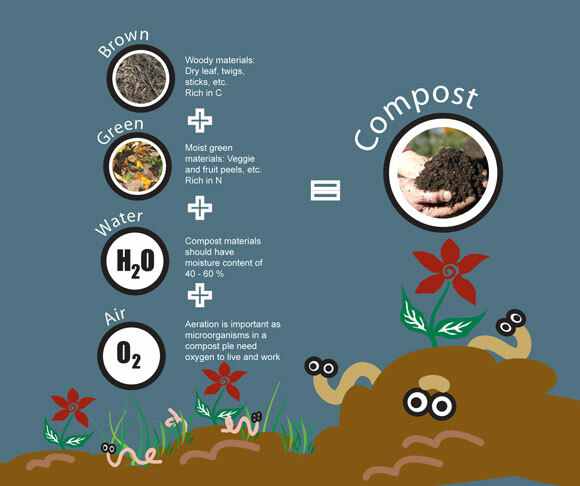 Four key ingredients of composting are brown material, green material, air and water. Green and brown materials are biodegradable organic matter that forms the main ingredient for composting. Green materials are rich in nitrogen and brown materials are rich in carbon. It is important to have a 50:50 ratio by weight of green and brown in a compost pile. Air and water is important for aeration and provide moisture for decomposer organisms. Complete and perfect compost should be friable, cool, dark in color and exude an earthy smell. decomposition is complete and it is ready for use. Lay a layer of gravel or stones at the bottom of the pot for aeration. Put a layer of soil (about 2 inches) on top of it. Put in green materials and cover loosely with a layer of soil. For the next layer, put in brown materials and cover loosely with a layer of soil. At every layer that is covered up by soil make sure to water it (damp). Do this alternately until the pot is full and move to the next pot. It is important to make sure all holes and crevices are covered with soil to avoid pest and pets from digging up the food. 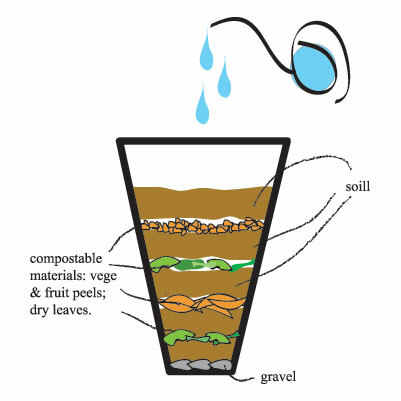 During the decomposition process, make sure your compost is moist and well aerated. Oxygen is important for your compost in order to avoid the anaerobic process from taking place. 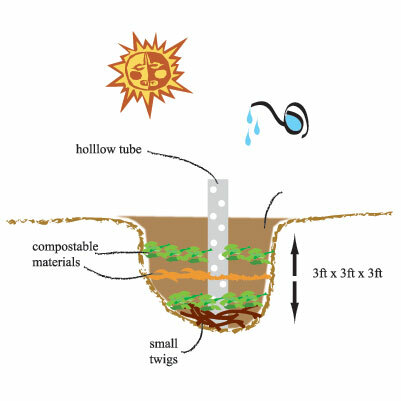 Once in a while, try to fork some holes into your compost as this allows aeration. Please note that there should not be any bad odour during the process except for an earthy/natural scent. The compost will be ready for use in 4 to 6 months.